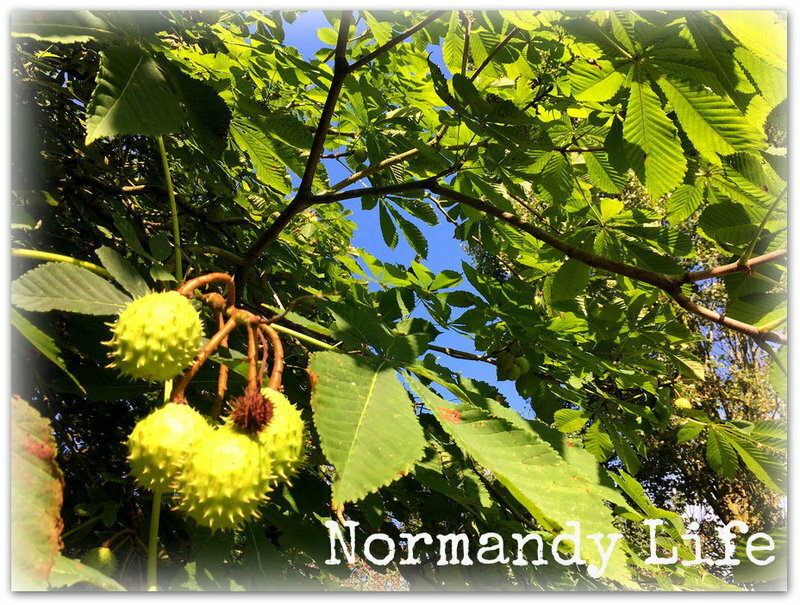 Normandy Life: Mosaic Monday # 33 - what a sight to see! Mosaic Monday # 33 - what a sight to see! One day last week, on our way home from walking Fleur in the woods at Cerisy, we stopped off at the Local Tourist Board office to look at the new displays and to pick up some brochures of nearby places of interest that we like to take our visitors to. The Château de Balleroy has always been # 1 on our must see list, click here to visit their website in English. It's been almost six years since we met English blogger Jackie there (you can read about her visit by clicking here) and I was interested to find out if there was anything new there to see. Things you might like to know about the Château. 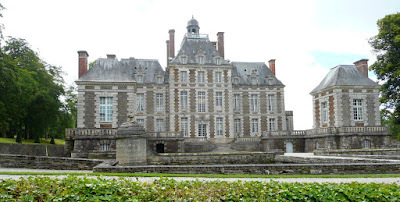 Built in 1631 for Jean de Choisy by architect Francois Mansard it is still owned by the family of the late Malcolm Forbes (US newspaper magnate) who bought the Château in 1970. The French formal gardens were designed by Henri Duchene at the beginning of the 20th century. Dotted around the English style park are benches and picnic tables for visitors to enjoy and some of the outbuildings now house a tea room, balloon museum and gift shop. The Abbaye Cerisy La Foret dedicated to Saint Vigor, Bishop of Bayeux, was founded in 1032 by Duke Robert the Magnificent (you might have heard of his son William the Conqueror, 1066 and all that). A jewel of Roman architecture the apse is on 3 levels with 15 windows and the abbey archives are housed on the Room of Justice. Here's a link to their website (in French). Both the Château de Balleroy and Cerisy Abbey will open their doors to the public on 1st April. The Château de Colombières, a XIVth century Historic Monument, is what I call our "local" château as it only takes 5 minutes to drive there from home. It may be local but it contains one thousand years of secrets, intrigue and passion inside it's fortified walls. 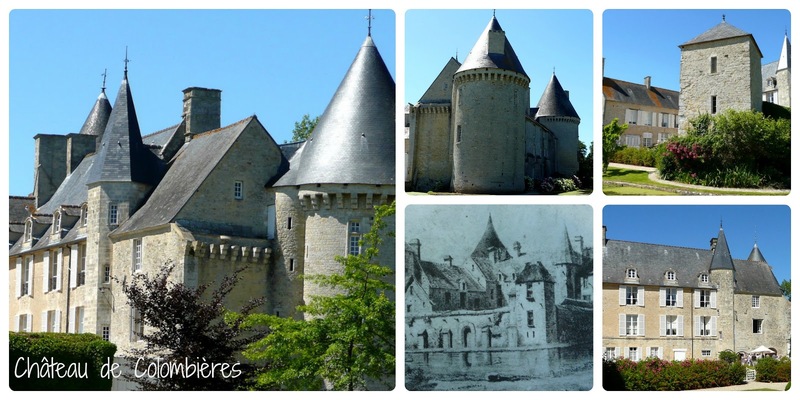 You can visit the Château's website here then click on the tabs to learn about it's fascinating history. 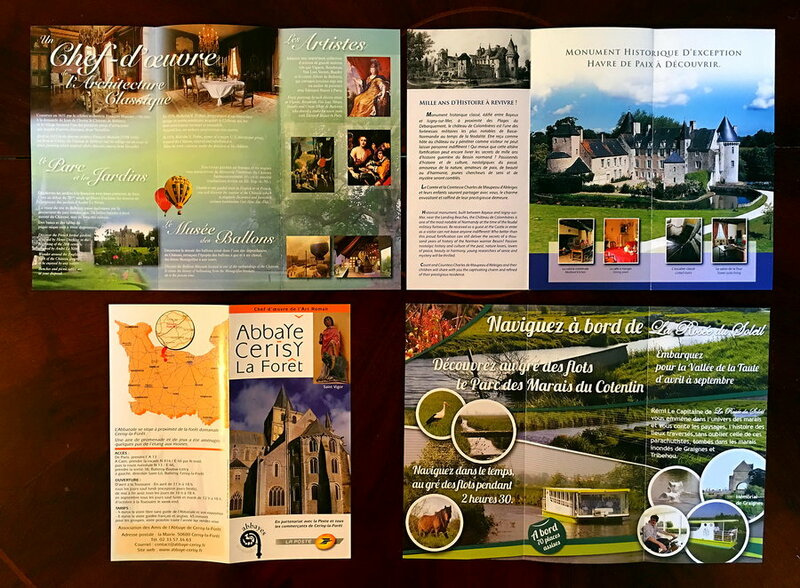 The fourth and final brochure that I collected that day was for a sightseeing tour on board La Rosée du Soleil through the Parc des Marais du Contentin (Park and Marshes of the Contentin Penisula). Our village in situated on the edge of the Marais and so this is a trip has been on my to do list for many years, perhaps 2017 will be the year it happens? What a treasure of sites to see in your area! I'll be back to explore those links. Maggie, I'd love to see these. Hope you do and will share photos. What wonders there are in your part of the world - and so close to your home. Your visitors are so lucky to have you to help find wonderful places to take them. We have nothing that compares here in the US - thanks for sharing the links and the information. It's lovely to plan short summer trips. I plan & make them too, we don't have here many stone castles but plenty of wooden mansions. I'm sure that your visitors love to see your treasures. Happy MM! There is such wonderful history and intriguing places to visit where you live, Maggie! I hope you do get to visit La Rosée du Soleil through the Parc des Marais du Contentin this year! Sometimes it is easy to loose touch with what touristy things are in our own backyard, so it's great to stop by a tourist centre and check out what is new. And a great way to re-discover our own areas is when friends come to stay. Happy touring! What a wonderful tour guide we have in you Maggie! Your brochures have much more information than the usual travel books. You're well prepared for the invasion - I imagine there's no shortage of visitors from across the English Channel! 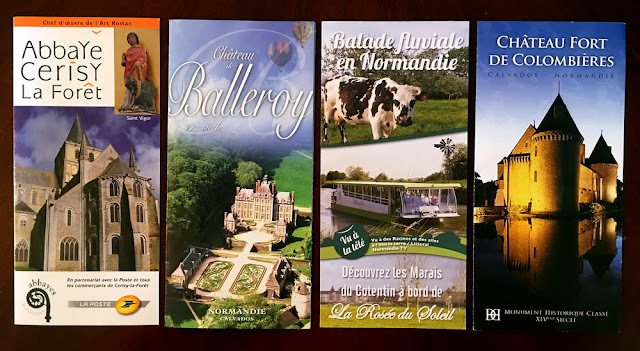 France has so much to offer the tourist market. 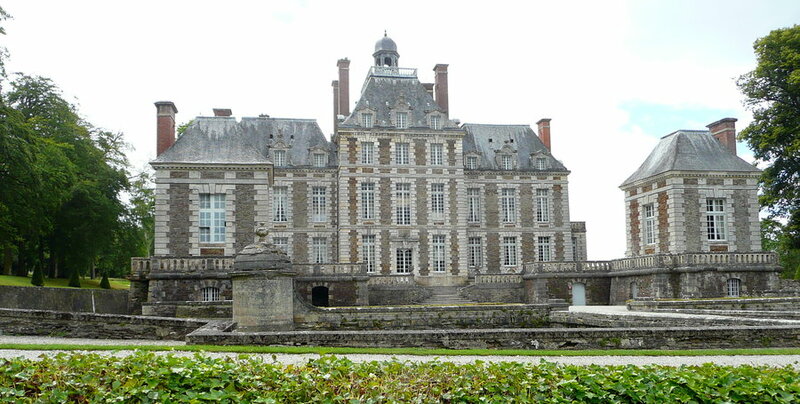 We've visited several palaces and Chateaux on our many trips to see our daughter. One of my favourites is Château Vaux-le-Vicomte which we've visited twice. Fontainebleau Palace is another we love. Thank you for this Maggie. I found the Abbey site fascinating. By the eleven hundreds this style of Norman church architecture had even spread to Scotland....on a smaller scale. The chateau looks splendid! And your lovely mosaics should probably be displayed on your travel agency's walls. Thank you for hosting this sharing party. Such wonderful and interesting places to visit. Have a great week. PS: Your travel brochures mosaic, Maggie, inspired me to do a "Marvellous Melbourne" mosaic to entice people to visit our lovely city Downunder... Autumn is a wonderful time to visit Melbourne! That's very considerate of you to prepare for visitors in this way. I really enjoy showing people around when they visit. You have wonderful sites to see for sure. Thank you for hosting Mosaic Monday Maggie! Very beautiful indeed, Maggie. How fun. Now I add that to the bucket list, too! And that beautiful blue sky makes me smile! What wonderful history to absorb. Much beauty to behold in your area! Only 5 minutes away! Amazing! You are so fortunate to live in close proximity to so many historical places. Thank you Maggie for showing more travel ideas, love the photos. Thank you too for your 33rd Mosaic Monday. You have some incredible architecture! What an intriguing collection of chateaux, such history, such grandeur, so different from what's 5 minutes away in my neck of the woods! So interesting to read about the various owners, too. Thanks for hosting, Maggie. Wishing you a lovely rest of the week. A set of links like this is a treasure trove for anyone thinking of visiting the area. I wish I could link up with Mosaic Monday, a few stolen moments are all I can manage at this point due to family obligations.